Be the first to share your favorite memory, photo or story of Stacy. This memorial page is dedicated for family, friends and future generations to celebrate the life of their loved one. Mrs. Stacy Lockridge Watters, age 42 of Cedartown passed away at her residence Wednesday, March 20, 2019. Stacy was born in Rome, GA on December 23, 1976. She was a graduate of Cedartown High School Class of 1995. She was a long-time active member of Cedartown Church of God and had been employed by Floyd Medical Center for many years. 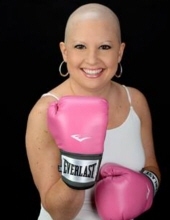 She had a great love for her family and friends that supported her throughout her 10-year battle with cancer. She was preceded in death by her brother, Scotty Lockridge; maternal and paternal grandparents. She is survived by her loving husband of 22 years, Kevin Watters; daughter Kailyn Watters and her fiancée, Sam Martin; son, Bryson Watters; mother, Sharon Wilkie; and father, Preston (Wendy) Lockridge. The funeral services to celebrate the life of Mrs. Watters will be held Sunday, March 24, 2019 in the sanctuary of Cedartown Church of God at 2:00 PM with Pastor John Moates and Pastor Justin Grant officiating. Interment will follow in the Greenwood Cemetery with Rev. Sammy Stephens officiating. The following gentlemen will serve as pallbearers: Kyle Watters, Jason Shuman, Josh Fenley, Jose Nevarez, Breton Watters and Aryn Watters. The family will be receiving friends Saturday evening from 5:00 PM until 8:00 PM in the sanctuary of Cedartown Church of God. The Smith & Miller Funeral Home of Cedartown is honored to serve the Family of Mrs. Stacy Lockridge Watters. To send flowers or a remembrance gift to the family of Stacy Lockridge Watters, please visit our Tribute Store. "Email Address" would like to share the life celebration of Stacy Lockridge Watters. Click on the "link" to go to share a favorite memory or leave a condolence message for the family.